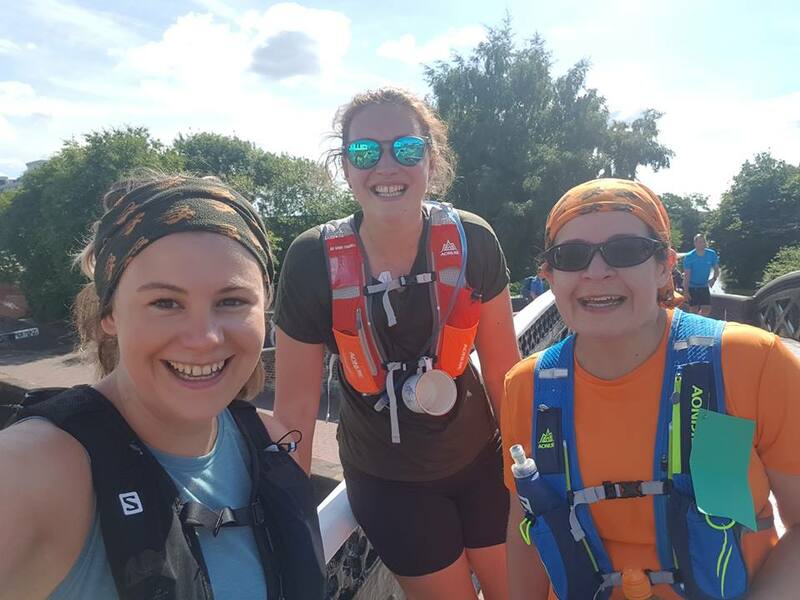 This week was mainly about the 18-mile Canal Canter race I signed up to back in March when I wasn’t able to do the Manchester marathon. I downsized to the 18-miler from the marathon when I went to do an easy 10-miler the appropriate amount of time before and found it not easy enough. My training runs in the week then the report below. Tuesday – The One With the Wrong Rucksack. I thought I’d better test out my running rucksack so got it out of the cupboard and put it on to run to running club, round the club route and home. But no, I picked up my normal (actually a cycling so extra long) rucksack and was surprised it was all wrong, rubbed my neck etc Mary Ellen and Ursula did sterling work trying to sort it out, but. I was very whiny then got home, at which point my husband helpfully pointed out that the running rucksack has pockets on the waist straps and is smaller. Oh. 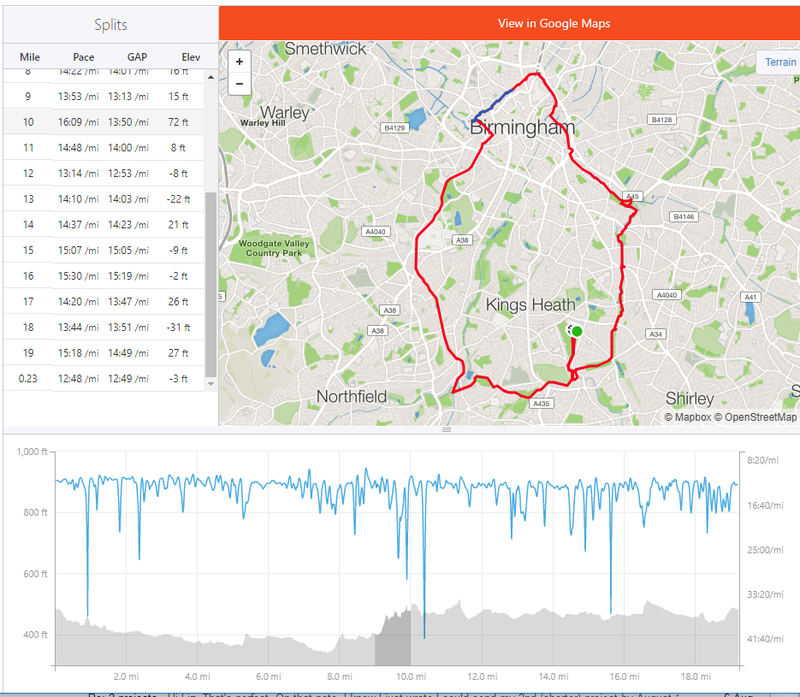 So a good run in the (hot) circs. Thursday – I panicked over rucksackgate and somehow bought myself a whole new one – the Geila Hydration Backpack by Aonjie, a mere £24. I had to wait for it to arrive so then went out for a quick run around the block with the ever-long-suffering Mary Ellen and Caroline. It was great and solid so all good for Saturday. No yoga this week, I was really sore of hand and elbow from bites on Wednesday and didn’t want DOMS from Friday. Should have stretched and rolled more. And slept more. Oh well. I’d done a 16-mile run last week and gone over the beginning of the route: very important and useful. Thank you, Claire! I had my usual mixed mild chili beans and other veg with brown pasta and a tea cake for dinner and tried to get an early night. Bernice came over at 8.15 and after saying hello to the cat and Matthew, took us round to the rugby club. 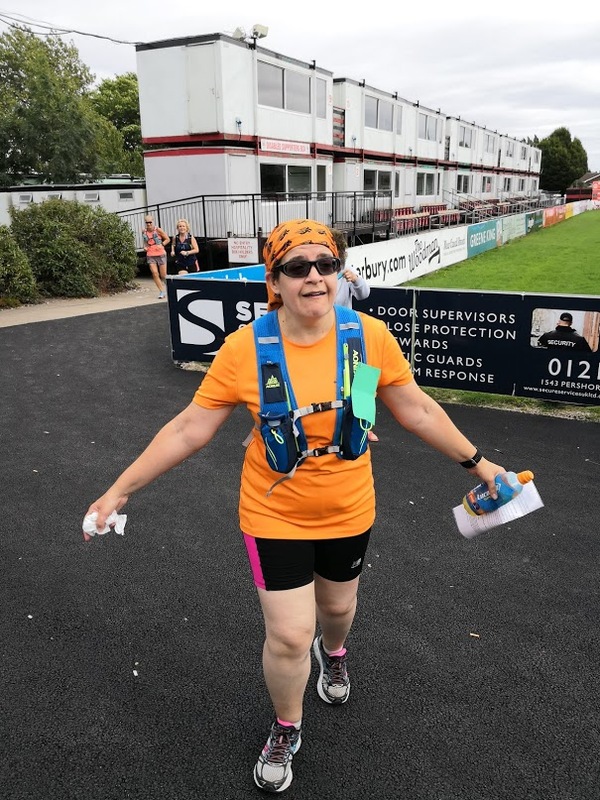 It’s not far away but of course I didn’t know the way to drive there … Bernice is a lovely Sedate Lady who I’ve been running with for a few years and through four marathon campaigns (three of mine and one – London! – of hers) and it was lovely to be running together again after she moved away from the area. Stretches and poses before the start. “Rugby poles” we would be desperate to see at the finish. We had been issued with instructions which were unlike anything I’d dealt with before. 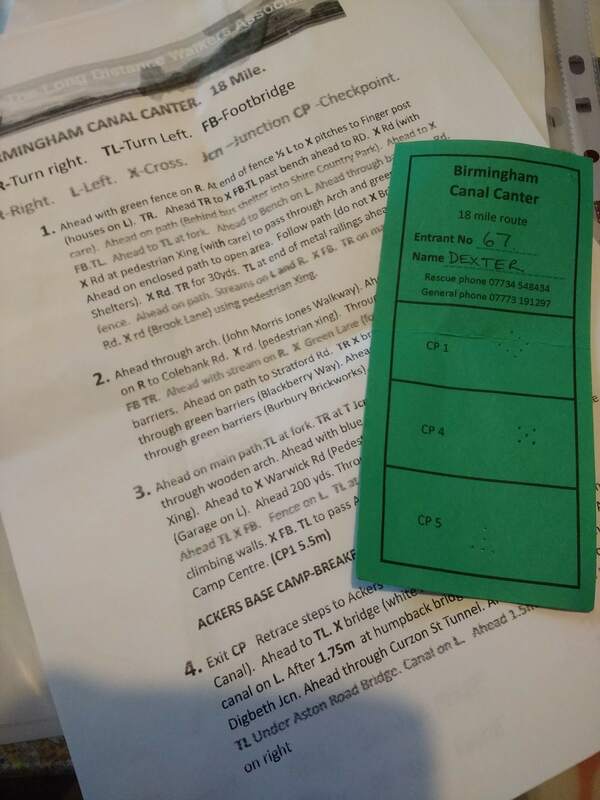 Bernice had had them at another race by the same people in the Malverns and was a complete star reading them out – combined with my knowledge of the route we did OK. We had this green card to get stamped at the checkpoints. Instructions (Bernice = a star) and the card we had to get validated at each checkpoint. We set off down a grassy slope – I am very much a ROAD RUNNER and this was outside my comfort zone already! We were careful and stayed at our pace even though we were quickly at the back of the runners. We did run with a bloke for a while. We came to a split in the path and felt left was correct but found an arrow on a tree that pointed right … up a big hill on a cat-littery sort of surface and … oh, a lot of other runners and walkers and a canal where it shouldn’t have been (I think this was actually on our way back). So we turned round, found the right way and on we went. 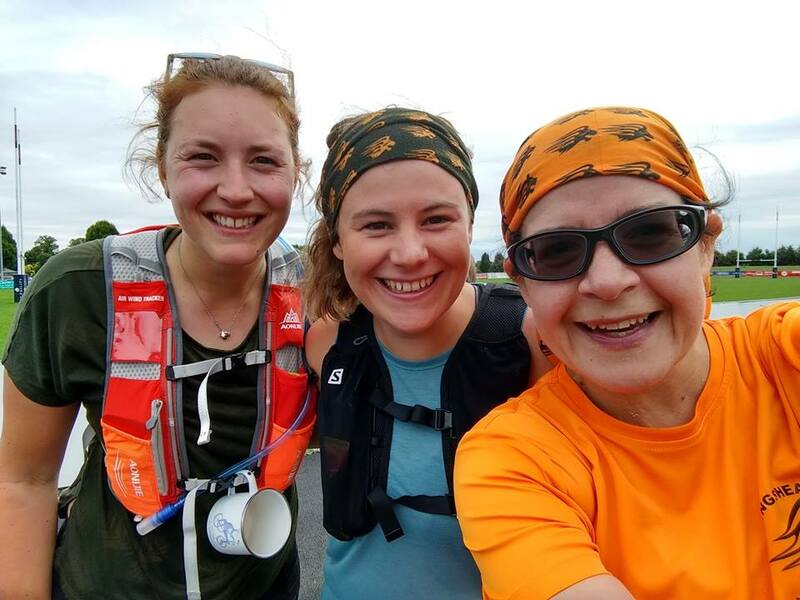 A lovely surprise: we ran into our club’s 9 mile half-marathon training, led by the lovely Grace, Sara took this pic of us as there were her, Sonya and Caroline from our Sedate Ladies group among them. Taken by Sara when we ran into the club’s half-marathon training. Just before another section of green pathway next to the river. On along the River Cole valley and across the horrible green webbing stuff that I fell over (not in this location) the other month. I was SO GLAD I’d run this part with Claire already. We gathered up Imogen, who was running on her own, and took her the rest of the way with us. Yay, new running friend! 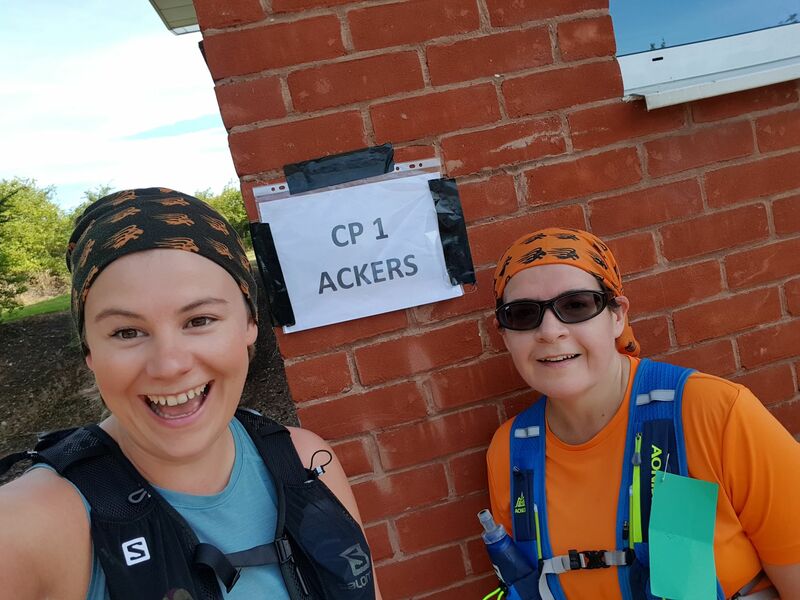 And we got to the first checkpoint at the Ackers (remember that weird ski slope from my 16-mile run). We had a loo break and could have had a cuppa and toast, I topped up my lucozade sport bottle with cold water. A bit complicated going in and out of the place but I knew about the hill up by the ski slope. First checkpoint reached! Tea and toast! A few people thought we’d gone wrong but thank you again, Claire (I shouted Thank you, Claire!) and I knew what to do. Finally we’re on the canal. And very pretty it was, too. It was quite sunny but not as hot as it could be. I look a bit desperate in all these photos, not sure why! Highlighted is mile 10 which had 72 ft of climb. There had been some canal bridges and tunnels that were a bit rough under foot or steep and challenging, and we walked up these, but this section was brick underfoot, with slopes next to locks where we had raised bricks for grip / tripping over or flat bricks. My right glute and ham started to protest and my calves, and I got a bit nervy and upset (no actual tears). It was fascinating to go under Digbeth and Aston and see it all from this angle, but also stressful. 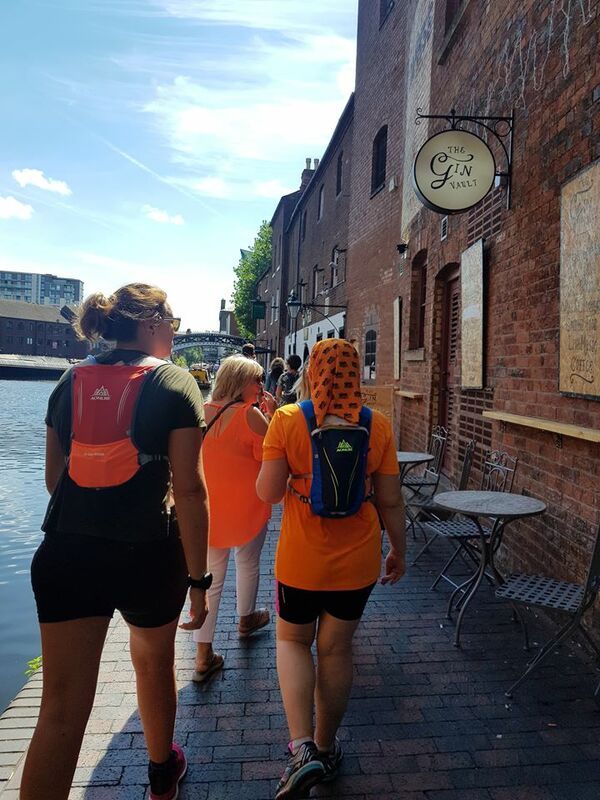 We made it to the most complicated part around Brindleyplace where the canal divides and braids and goes around itself, past the Barclaycard Arena where we attended the National Indoors a bit ago. We were walking through the crowds here – not having a race number meant we just looked like runners and it was a bit hard to get through. Imogen and Liz going through Brindleyplace. 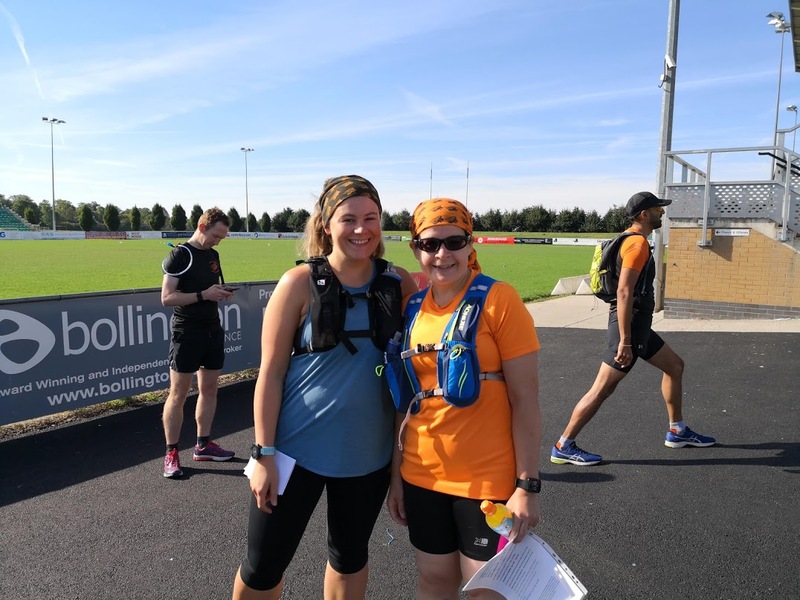 Rucksacks looking good – and we matched! We got a bit worried coming under Broad Street and along, esp as Brindleyplace was the second place where the marathon runners/walkers left us and did an extra loop. But we were right! 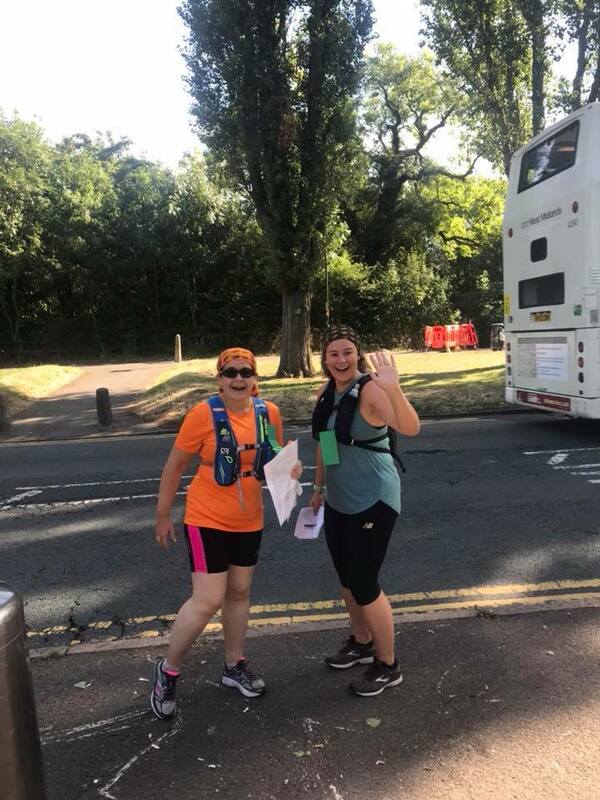 And then we were out and “Where’s Five Ways station?” “There’s Five Ways station” phew, and we reached the second checkpoint at the Vale, the University of Birmingham’s main residential area. More great volunteers and a cake stall! I didn’t partake of cakes but I filled up my bottle with orange squash. I was getting very fatigued and a bit upset, with aching legs. We’d agreed on a 9 min run / 1 min walk strategy from Checkpoint 2 but I was flagging, and upset about that. 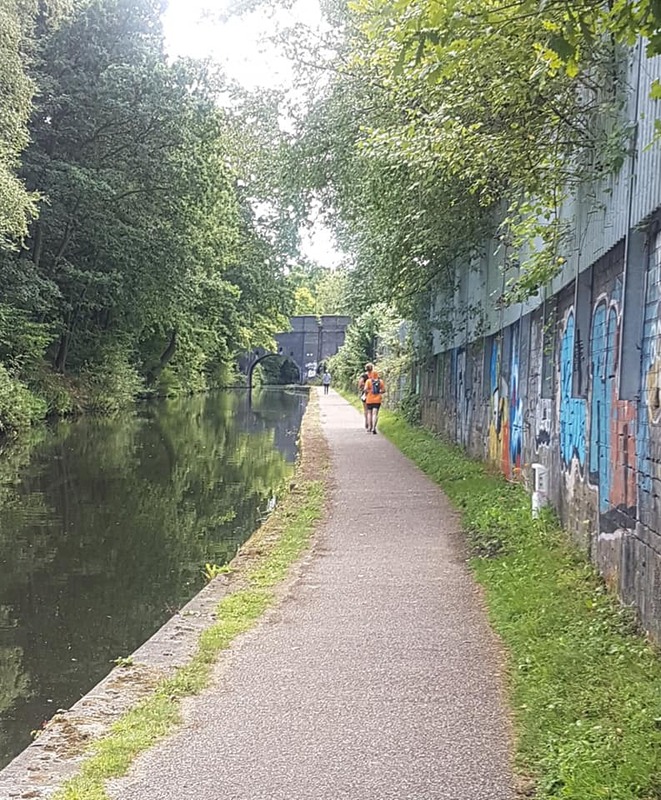 Then we got to my favourite bit on this canal – the aqueduct over the Selly Oak bypass and I cheered up and steamed over it, with Bernice grabbing an iconic shot. I am running, honest. And that’s a drop to the road on the right – so cool! Through Selly Oak, Dave and Thomas overtook us, doing the marathon, as did a few other marathon runners, cheering us on very matily. 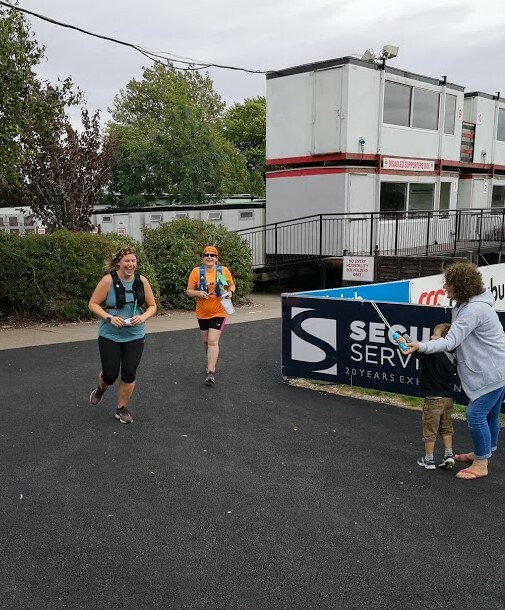 Then a cheer and it was our clubmate Helen, running home from work! She caught this classic urban canal shot for us then said hello and ran with us for a while. What a lift for us! Typical Selly Oak canal view – an urban canal. By Helen. She managed to get a shot of us from the front, too – so lovely! She said goodbye and we pressed on. Strong ladies / struggling ladies. By Helen. After Bournville Station we were on the club’s Thursday evening canal route which meant a bit less stressing about getting lost. We had a sit down on the bridge by the lock keeper’s cottage at one turn then Checkpoint 3 with its savoury snacks was there. “Are those pecans?” “Um, no, pork scratchings”. I had some crisps, glad of the salt, and a squash and water top-up. This is by a guillotine lock which is pretty cool. Checkpoint 3: The guillotine lock. Savouries available and taken advantage of. Yes, it says “fool” on the bridge. 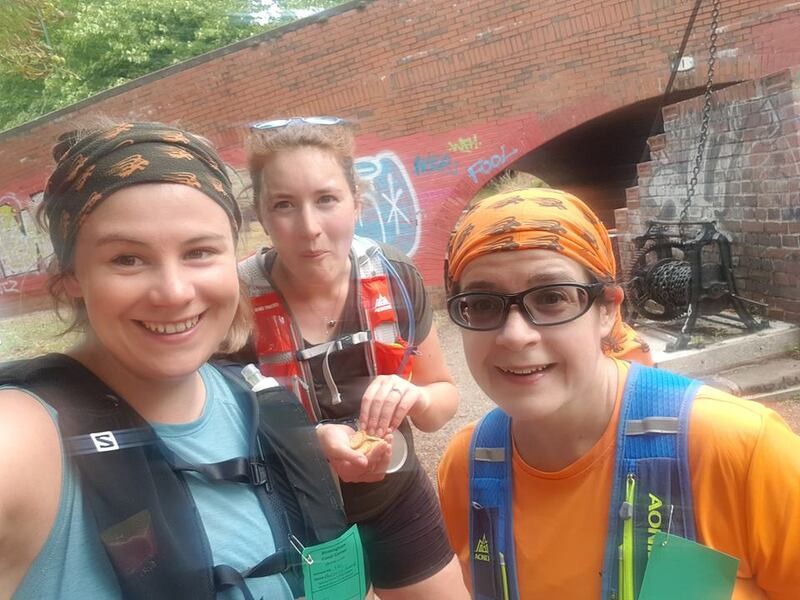 We knew we’d be over 18 miles because of the error at the start but we kept pressing along the canal, up and over the road where we normally come off for the club run and round behind the leisure centre. 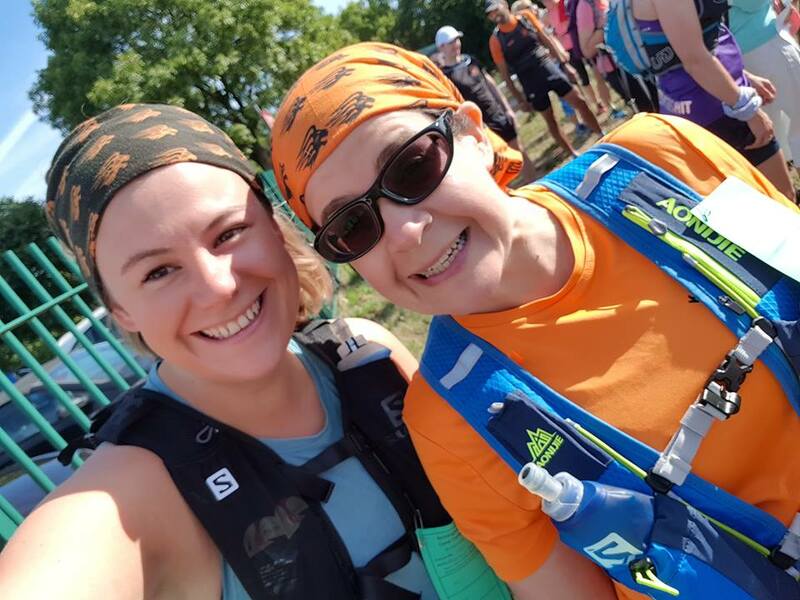 We met two ladies who had done extra mileage in error and more marathon runners. [edited to add: a bloke shouted out of a canal boat when we were doing a walk break, “Oy, you’re supposed to be running”. I might have shouted back, “Jeff Galloway method, mate!”] Where was the bridge to turn off? More forest and cat littery path and I had a brief resurgence of energy at about mile 18. But when would the foresty bit end? Then, oh cruelty, we came out at the bottom of the grassy slope we’d run down at the start. I helpfully pointed out that no one could see us until we crested the brow of the hill, so, with Imogen going ahead, Bernice and I marched up the hill then started running. Up the hill, among the tussocks, along the car park bit, squeeze round a low fence, up the road, where’s the finish? Don’t know. Round the back of the commentator’s booths and there were our husbands and Bernice’s mum-in-law and small son with a bubble making wand, very much making up for the lack of a balloon arch. Coming through the finish! By Matthew. Bubbles supplied by Bernice’s mum in law and son. Apparently I was smiling just before Matthew captured this truer representation of the morning. And here we are at the end. All photos by Bernice except those mentioned as being taken by others. I’d consumed about 1 litre of drink, a banana and four gels (2 gu, 2 torq). Three relieved ladies. By me. There was food but I didn’t really want any as I never do after a long run – I had my banana milk Matthew had brought and we got our certificates (we hadn’t realised the time on those was the time we went into the club house to request them so isn’t quite the same as our watch times). Said hello to everyone who had finished and was around (Kevin had done 14 by midday and gone home as planned; Suki was still out on the course) and Matthew and I walked home. The inside string behind my left knee was hurting on the way home and I was a bit worried. A big bowl of Shreddies and a shower, a lie-down, some bread and cheese, fishfingers, chips and mushy peas, and an early night. Sunday morning I was tired and a bit achy but that has subsided through the day. I was feeling a bit ambivalent about this and nearly didn’t blog about it. It was hard and although I’d practised on different surfaces and on the canal, and in the heat, but I hadn’t reckoned with the brick-based slope bit in town, which did me in. I felt I should have felt stronger for the second half than I did, but I just hadn’t practised for that – stairmaster at the gym would have helped. Moving foward, I don’t love racing and don’t need to do it to run (I know that’s quite unusual and I’m lucky). I am going to ask our club coaches for some gym sessions to build strength, as well as going to more of their sessions. I think I’m going to attempt the 26.2 mile no 11 bus route in October but with plenty of rest breaks and sit-downs. You should be able to see the relive of this run here. Thank you. It was such a big challenge! Whoa, those cakes! Still remember reading one of my first UK running reads (maybe Run Like a Girl?) and wondering if cakes were the same in US/UK English. That headless rugby player is crazy, but I’m a magnet for those photos as well. 18 miles seems an odd distance in both miles and KM, yet you’re the second person to do a race of this distance in the last couple weeks. Your struggle to get through the bottleneck where you just looked like runners v racers is the issue I have with some Central Park races. When it’s gorgeous, the park is understandably crowded with runners / bikers and it can be hard to get through if non-racers are on the race course. I also imagine it’s how runners feel during the Great Manhattan Saunter especially when it gets to the city streets portion. I love Selly Oak – so gorgeous. Thank you. Yes, I know you’ve mentioned your shock at the cakes before! I think it’s an ultra thing and unfortunately I can’t actually eat them but it was cool to see and my friends took advantage. I hadn’t thought of that with races in central park, although we have tangles at parkrun sometimes. It is a bit tricky and was hard as there is no barrier between the path and the canal so I don’t like to go too near the edge! Selly Oak by the canal is pretty, in real life it’s fairly manky, so it’s quite funny. I do like the urban walls and graffiti next to the trees. 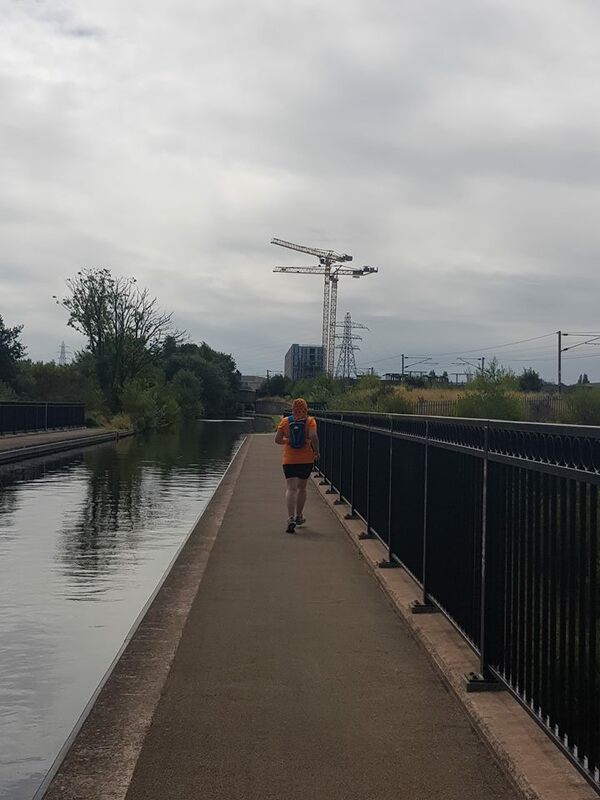 I might try to run some of the route again as a photo run as the industrial archaeology in town was pretty cool. The bubbles were a lovely touch, and it was sweet to see Bernice’s son so happy to see his Mom. I think we might be planning some other races. Maybe. My knee is weirdly fine, thank you – I was a bit worried as that’s not a place that has ever hurt after a race or at any other time. I seem to be pretty well back to normal today, thank goodness! And yes, it was challenging but there was a fun to that, and I feel proud to have gone outside my comfort zone like that. I love that this race had walkers, runners and run/walkers. Always great to see variety like that at a race. I also love that they had aid stations filled with lots of drinks and food. Seems like a well-organized race. Yes, it was really nice to have the mix and the walkers cheered us on as we passed them and the faster marathon folk cheered us on as they passed us, so all very nice. They had two more aid stations, one under a motorway junction I’d like to get to next year, and all was very cheerful. Certainly very different from the big road races I’ve done. This looks like a fun race–as hard as it felt, you guys supported each other! Great job! Yes, it certainly helped that Bernice and I dragged each other through our various marathon training, I know she’s not loud about suffering but can usually tell when she’s finding it hard; she knows I wail but press on! It was fun and I’m proud of myself for going out of my comfort zone quite a lot (running on grass? What?). Great going! You did it! I would have such a hard time with all those directions! I prefer a well-marked route. So great that you had some friends to do this with – that would make all the difference to me. Thank you – yes that was a bit tricky although actually the instructions were brilliant and made a lot of sense. I think they would have been difficult for faster runners or if you wanted a time, though, as you had to stop sometimes and go through what you’d done to make sure you were on the right track. I wouldn’t have done it on my own and we were glad we scooped up Imogen as she didn’t know the area as well as we do! Congratulations! Sounds like you had a good time. Those cakes! 🙂 How interesting for a mid-run snack! It’s also fascinating how non-US races start so much later too- fortunately it sounds like it wasn’t too hot for you, that’s good. Oh, do all US races start super-early? 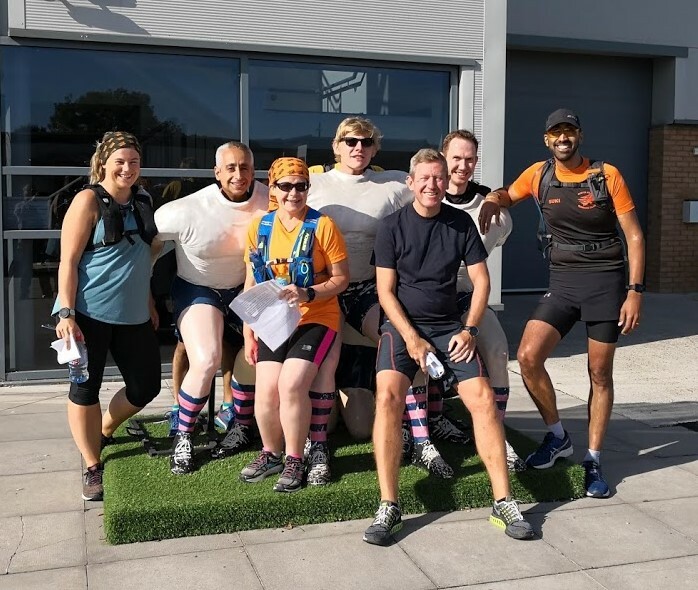 This one was quite early for us, starting at 9.30, as we all started together – normally in a bigger race of course you spend ages just getting to the start. The weather is generally a bit more temperate, though and it had gone down from earlier in the month, thank goodness. 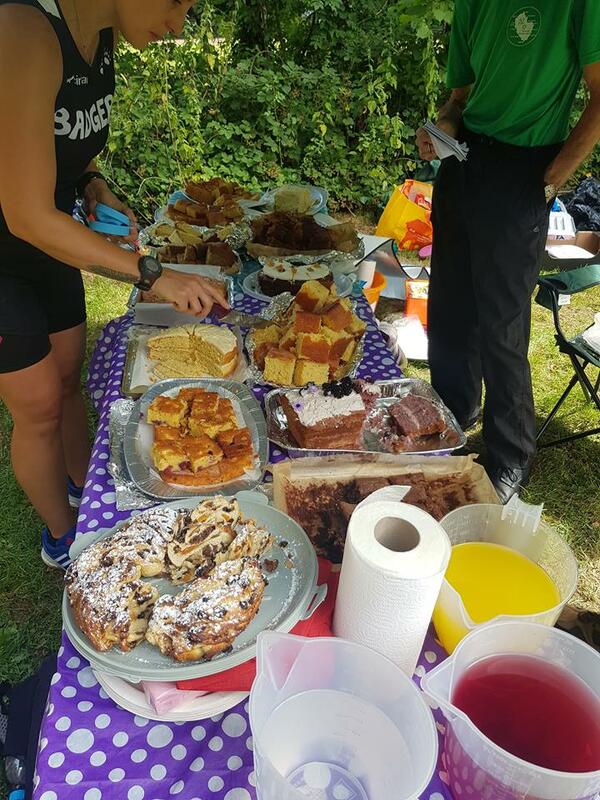 The cake thing was good – it’s a real feature of ultras here, too, and was largely because of the walkers, however I know some of our marathoners hoovered up a lot of it. I couldn’t find cake I could eat (I have high cholesterol if I don’t keep off the saturated fat and now get a stomach ache if I do eat fat) but it was fun to see and made it a warm and friendly race. Wow, that spread of cakes!!!! It sounds like a bit of everything in this race…a variety of surfaces, etc. It’s hard to train “exactly” as the race route will dictate, but it sounds like you made the best of it. Yes, I think we had grass, sandy paths, earth + gravel, earth + weird hard netting that I fear, canal towpath, ashphalt park paths (sometimes these two the same stuff), brick, concrete, plus bridges and steps. The only thing I could have trained more for was that middle section and I’m taking steps to work on my strength now anyway, so that should be better next year. What a fun adventure! I loved your recap. I think we need some cake stalls here in the US! Thank you! I think it’s more ultras and walking events that have them, although our running club has a pretty epic picnic after cross-country events! Congratulations on the finish and what a great recap! Despite the challenges, you look so happy in your photos with your crew. 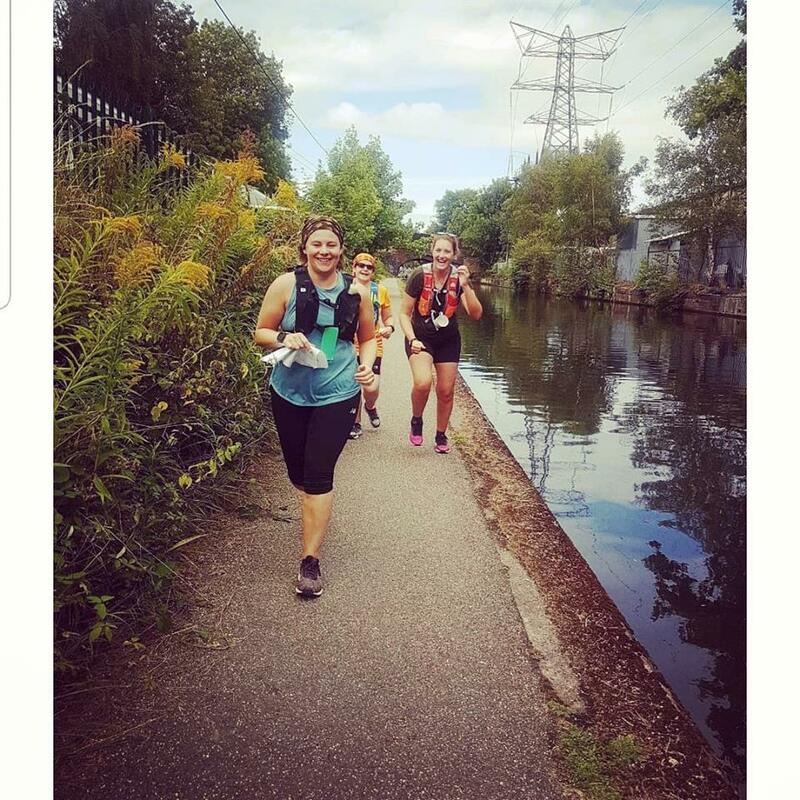 The course photos are beautiful too – I love running routes that go by water and it looked like you got some of that in this course! Also, I can’t believe they had cakes for the runners! I probably wouldn’t have eaten them either, but what fun! Yes, it was really pretty and where it wasn’t pretty (the brick slopes in the city centre where I was concentrating on not collapsing rather than pics) it was really interesting industrial archaeology style landscapes. We were by water pretty well the whole time, as we followed a small river up to the canal, then along the canal until the last mile and a half. 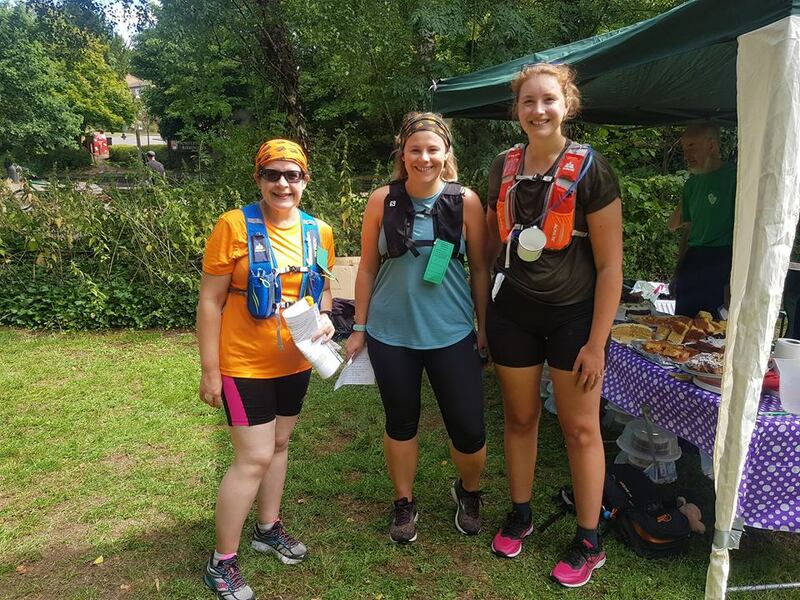 Great job on the race – the canal paths look like a lovely spot to run! I love the idea of a cake aid station, though I suspect I’d regret it later if I ate much cake. Congratulations! It usually takes a while for me to feel good about a race. I hope this is the case for you because you really should be proud of your efforts, especially with all the different surfaces and terrain encountered. It is very interesting to read how races are set up in other places. Is it typical to start late and have checkpoints? We have aid stations but don’t have to officially check in. Thanks for linking! Thank you, it’s really helpful to know other people feel the same about races. I am feeling proud of myself, esp as some friends have commented about doing it in other years and finding it tough. The checkpoints thing was because it’s a long distance walking association thing. I know they have them in the trail ultras some of my mates do, but it’s not something I’ve encountered before. The cakes were a bit unusual, too, although cake and picnics do feature quite a lot. I think the start time was quite standard – I’ve started later in half-marathons esp big ones where you have to wait to get through the start. I suppose our more temperate climate allows for that. I was really ambivalent about writing this up so glad I had the wrap-up to inspire me to! That looks like so much fun! Congrats your race! You did fantastic. Those cakes look delicious, too. Thank you – I feel better about it with some distance and it’s definitely one I would do again. They did look fab and I know some of my fellow runners indulged!